The Birmingham Six were Hugh Callaghan, Patrick Hill, Gerard Hunter, Richard McIlkenny, William Power and John Walker. In a famous miscarriage of justice they were sentenced to life imprisonment in 1975 for two pub bombings in Birmingham on November 21, 1974 that killed 21 people. Their convictions were overturned by the Court of Appeal on March 14, 1991. Although the Balcombe Street Gang admitted responsibility for the bombings which led to the wrongful imprisonment of the Maguire Seven and the Guildford Four, the perpetrators of the Birmingham bombings were never revealed. The Birmingham bombings were attributed to the Provisional IRA, although the group denied this two days later (they eventually conceded that they were responsible). The devices were placed in two central Birmingham pubs: the Mulberry Bush (later renamed, then redeveloped in 2003 as a tourist information office), at the foot of the Rotunda, and the Tavern in the Town, a basement pub on New Street (later renamed the Yard of Ale). The resulting explosions, at 20:25 and 20:27, collectively were the most injurious and serious terrorist blasts on the island of Britain up until that point; 21 people were killed (ten at the Mulberry Bush and eleven at the Tavern in the Town) and 182 people were injured. A third device, outside a bank on Hagley Road, failed to detonate. Five of the six men arrested were Belfast-born. John Walker was born in Derry. All six had lived in Birmingham since the 1960s. Five of the men, Hill, Hunter, McIlkenny, Power and Walker, had left the city on the early evening of November 21 from New Street Station, some hours prior to the explosions, to travel to Belfast to attend the funeral of James McDade, an IRA member who had accidentally killed himself while planting a bomb in Coventry. They were seen off from the station by Callaghan. When they reached Heysham they and others were subject to a Special Branch stop and search. The men did not tell the police of the true purpose of their visit to Belfast, a fact that was later held against them. Hill had travelled to visit his seriously ill great-aunt and planned to attend the funeral while in Belfast. While the search was in progress the police were informed of the Birmingham bombings. The men agreed to be taken to Morecambe police station for forensic tests. On the morning of November 22, after the forensic tests and routine questioning, the men were transferred to the custody of West Midlands Serious Crimes Squad police unit. All men were interrogated by Birmingham CID and insist that they were beaten, threatened and forced to sign statements written by the police over three days of questioning. Callaghan was taken into custody on the evening of November 22. The men first appeared in court on the following Monday, November 25, and were remanded in custody and taken to HMP Birmingham, Winson Green. At the prison the six men claimed they were subject to further ill-treatment. When they reappeared in court on November 28 all the men showed visible bruising and other signs of torture. In June 1975 fourteen prison officers were charged with varying degrees of assault but were found not guilty. In 1977 the six men pressed charges against the West Midlands police; these charges were dismissed under issue estoppel. On May 12, 1975 the six men were charged with murder and conspiracy to cause explosions. Three other men, James Kelly, Michael Murray and Michael Sheehan, were charged with conspiracy and Kelly and Sheehan also faced charges of unlawful possession of explosives. The trial began on June 9, 1975 in Lancaster, England. After legal arguments the statements the men had made in November were deemed admissible as evidence. The accused repudiated the confessions at the trial. The other evidence against the men was largely circumstantial, through their association with IRA members. Although Hill and Power had tested positive for the Greiss test for handling explosives the later sample tests were inconclusive. The jury found the six men guilty of murder and on August 15, 1975 they were sentenced to life terms. In March 1976 their first appeal was dismissed. Journalist (and later Labour MP and government minister) Chris Mullin investigated the case for Granada TV's 'World in Action' series. In 1985, the first of several World in Action programmes casting serious doubt on the men's convictions was broadcast. In 1986, Mullin's book "Error of Judgment - The Truth About the Birmingham Pub Bombings" set out a detailed case supporting the men's innocence including his claim to have met with some of those actually responsible for the bombings. Home Secretary Douglas Hurd MP referred the case back to the Court of Appeal. In January 1988, after a six week hearing (at that time the longest criminal appeal hearing ever held), the men's convictions were upheld. The appeal judges, under the Lord Chief Justice Lord Lane, in their summing up strongly supported the original conviction. Over the next three years newspaper articles, television documentaries and books brought forward new evidence to question the conviction while campaign groups calling for the men's release sprang up across Britain, Ireland, Europe and the USA. Their third appeal, in 1991, was successful. New evidence of police fabrication and suppression of evidence, the discrediting of both the confessions and the 1975 forensic evidence led to the Crown withdrawing most of its case against the men. In 2001, a decade after their release, the six men were awarded compensation ranging from £840,000 to £1.2 million. The collapse of the case and other miscarriages of justice caused the Home Secretary to set up a Royal Commission on Criminal Justice in 1991. The commission reported in 1993 and led to the Criminal Appeal Act of 1995 and the establishment of the Criminal Cases Review Commission in 1997. None of the policemen involved were ever prosecuted. The Guildford Four were Paul Hill, Gerry Conlon, Patrick (Paddy) Armstrong and Carole Richardson, who were wrongly convicted in the United Kingdom in October 1975 for the Provisional IRA's Guildford pub bombing which killed five and injured sixty five people. They were imprisoned for over 15 years. On February 9, 2005, British Prime Minister Tony Blair issued an apology to the families and those still alive of the eleven imprisoned for the bombings in Guildford and Woolwich, saying in part that "I am very sorry that they were subject to such an ordeal and injustice (…) they deserve to be completely and publicly exonerated." There was never any evidence that the Four had been involved with the IRA—and they did not "fit the bill" in terms of lifestyle. Patrick Armstrong and Carole Richardson lived in a squat and had involvement with drugs and petty crime. At their trial the Guildford Four claimed they had been tortured by police until they signed a confession. After they were convicted of murder and received the mandatory sentence of life imprisonment, the judge expressed regret that the Four had not been charged with treason, which then still had a mandatory death penalty. During the trial of the Balcombe Street gang in February 1977 the four IRA men instructed their lawyers to "draw attention to the fact that four totally innocent people were serving massive sentences" for three bombings in Woolwich and Guildford. They were never charged with these offences. However, no evidence has ever been presented that proves the involvement of the four men, they never actually admitted any personal responsibility, and the IRA never identified the true perpetrators of the attack. The Four tried to make an appeal under Section 17 of Criminal Appeal Act 1968 (later repealed) but were unsuccessful and, in 1987, the Home Office issued a memorandum recognizing that it was unlikely that the Four were terrorists but that this would not be sufficient evidence for appeal. In 1989, a detective looking at the case found typed notes from Patrick Armstrong's police interviews which had been heavily edited. Deletions and additions had been made and the notes had been rearranged. These notes and their amendments were consistent with hand-written and typed notes presented at the trial, which suggested that the hand-written notes were made after the interviews had been conducted. The implication of this was that the police had manipulated the notes to fit with the case they wanted to present. had started off with contemporaneous notes, typed them up to make them more legible, amended them to make them read better and then converted them back to hand-written notes. Either way, the police had lied, and the conclusion was if they had lied about this, the entire evidence was misleading and the Four were released. Paul Hill, however, stayed in prison until 1994, when another conviction of his (for murdering a British soldier in Northern Ireland) was overturned. Several family members of Gerry Conlon, including his father Giuseppe, his aunt and his 14- and 16-year-old cousins (the Maguire Seven), were also imprisoned in the same case (mainly for explosives offences). Giuseppe Conlon died in prison. Gerry Conlon's autobiography Proved Innocent was adapted into the Oscar- and Bafta-award nominated 1993 film In the Name of the Father, starring Daniel Day-Lewis, Emma Thompson and Pete Postlethwaite. Gerard Conlon, one of the Guildford Four, is reported to have settled with the government for a final payment of compensation in the region of £400,000 to £500,000. The Maguire Seven case was an infamous incident of wrongful conviction in the United Kingdom. The story, along with that of the Guildford Four, is told in the film In the Name of the Father. The seven, members of the same family, were falsely accused of running a bomb-making factory for the Provisional IRA in the early 1970s. One of them, Giuseppe Conlon, father of Gerard Conlon (one of four young people wrongly found guilty of the Guildford pub bombing), died in prison. He was arrested when he traveled from Belfast to England to try to help his son. Members of the London Metropolitan Police beat confessions out of some and withheld information that would have cleared them. The actual perpetrators admitted the bombings when apprehended and informed the police and the Director of Public Prosecutions that they had wrongfully sentenced others for these crimes. Despite this, no officers connected with the perversion of the course of justice were ever demoted or forced to resign. Prime Minister Tony Blair has apologized to the Guildford Four who were wrongfully convicted of IRA bomb attacks in England in 1974. 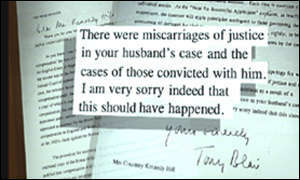 In a letter, Mr Blair acknowledged the "miscarriage of justice" which they suffered as a result of their wrongful convictions. Details of the apology are revealed for the first time in a special two-part edition of BBC Northern Ireland's Spotlight programme, on the changing fortunes of West Belfast man Paul Hill, to be broadcast on 6 and 13 June. Paul Hill, Gerry Conlon, Patrick Armstrong and Carole Richardson, were given life sentences for bombing public houses in Guildford, Surrey. Each of them spent 15 years in prison before the convictions were overturned by the Court of Appeal in 1989. Mr Hill and Mr Armstrong were also wrongfully sentenced for a bomb attack in Woolwich. A total of seven people died in the Guildford and Woolwich explosions. The apology, personally signed by the Prime Minster, was sent by Mr Blair to Paul Hill's wife, Courtney Kennedy Hill, the daughter of the assassinated American Attorney-General Robert Kennedy, and niece of the late John F Kennedy. The prime minister wrote: "I believe that it is an indictment of our system of justice and a matter for the greatest regret when anyone suffers punishment as a result of a miscarriage of justice. "There were miscarriages of justice in your husband's case, and the cases of those convicted with him. I am very sorry indeed that this should have happened."